ANDRITZ specialised in the construction of large irrigation and drainage pumps at an early stage in its development. Egyptians have used the River Nile’s annual flood to irrigate their land for more than 5,000 years. More recently, irrigation through canals has been used alongside large pumping stations. Now one of Egypt’s main irrigation canals is about to have its capacity extended. Systematic irrigation has a long tradition in Egypt and its people have not only cultivated areas flooded by the Nile, but also used the annual flood to irrigate specially prepared fields for thousands of years. The annual, predictable flooding of the low-lying plains and the Nile Delta has always formed the basis of Egyptian agriculture. In the 19th century, more intensive land use was needed as the population started to grow more rapidly. As a result, other methods were needed, such as control of flow through weirs and large canal systems. To effect irrigation through canals, a large number of pumps in large pumping stations were also used. The Nubaria Canal connects the city of Alexandria, the main Egyptian port on the Mediterranean, with the Nile. The canal is over 100 km long and has three barrages and four locks to regulate the flow. It was originally built to irrigate over 3200 km2 of agricultural land. Now this capacity is to be expanded by a further pumping station. The international technology group Andritz has a long tradition in irrigation and the company specialises in in the construction of large irrigation and drainage pumps. For example, in the 1960s and 1970s, Andritz started up and commissioned various pumping stations for irrigation in the Middle East and Africa, enabling the irrigation of 420,000 hectares in Sudan. For this project, located south of Alexandria, 17 Andritz vertical line shaft pumps will supply water to the Nubaria Canal. In addition to the pumps, Andritz will supply a set of spare parts as well as a pump acceptance test at the test stand in Graz, Austria. While a single pump can handle a flow rate of 0.69 m3 per second, all the pumps together handle a total of 11.7 m3 per second. Each pump achieves a head of 28 m and a shaft power of 222 kW. The total energy output of the pumping plant is 3.8 MW. 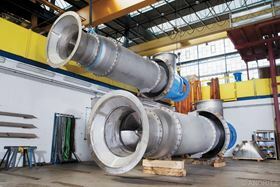 The high-tech pumps are developed and manufactured according to project-specific requirements. The pumps must have different properties depending on the medium to be conveyed so the choice of material and the correct machining process are crucial for the functioning and stability of the pump. A wide variety of materials are used, such as gray cast iron, cast steel, unalloyed and low-alloy steels, stainless CrNi steels, duplex, and super duplex steels, depending on the operating conditions and customers’ requirements. Andritz offers a complete range of impeller shapes for all combinations of delivery rates and heads, according to specific rotation speeds. By varying the impeller diameter and the trailing edge, the pump can be adapted precisely to the required operating points. In addition, Andritz has a hydraulically adjustable mechanism for continuous alignment of the impeller blade angle during operation. Thus, it is possible to react promptly to changes in delivery rate and head. The pumps, including spare parts, have now been delivered to the project site. The Andritz pumps are destined for a pumping station providing the water supply to the Nubaria irrigation canal, south of the city of Alexandria. Andritz to provide hydro- and electro-mechanical equipment for Morocco's new Abdelmoumen pumped storage hydropower plant.